It’s time to talk about the other great joy of going to Yuma. No, I’m not talking about the green chile burgers at the Yuma Proving Ground bowling alley (although they do make a pretty good burger). 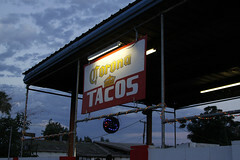 I’m talking about the variety of taco stands that can be found all over Yuma. Around 5-6 pm every day, all sorts of sleepy little stands all over town (but centralized on West 8th, aka Calle Ocho) fire up their grills and start mixing up fresh jamaicas and horchata. 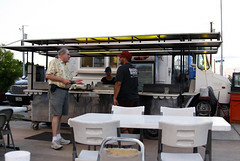 Yes, to me, that is the real Yuma culinary experience, eating tacos from all manner of little trucks, stands, and tents located on vacant lots and parking lots. Sure, a lot of people will look at me funny. I know most of my own coworkers and several of the Army guys think I’m crazy for getting most of the Yuma-area calories from little carts. And, at some level, I do understand some people’s reluctance to dine al fresco in a vacant lot, and a strong preference for their restaurants to have actual walls. But this really is good food, and the food cart vendors really put their heart and soul into it, resulting in some wonderful flavors. That, and $44/day food per diem goes an awful long way at taco stands! 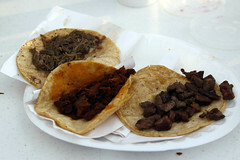 I’ve covered one such place before in this blog, Taqueria San Pedro. And, while it’s definitely not a “taco stand”, I always go to Los Manjares at least once on every trip. This time, I was making it a point to really try a lot of different taco stands and taco trucks. So I started out this trip with repeat trips to two favorites, Taqueria San Pedro (who is still dishing out wonderful tacos, and has upgraded their fixings bar to use some more advanced condiment trays) and Davids Market. Both were in excellent form, and had particularly good cabeza tacos that night. But, to really take it to the next level, I decided it was time to enlist the help of some experts. You see, most of these places in Yuma I didn’t ferret out myself, I found these through the help of both Chowhound and the mmm-yoso!!! blog which covers San Diego through Yuma. Particularly, Ed Dibble from mmm-yoso!!! is pretty much a walking encyclopedia of Yuma offbeat eats, so I sent him some email and we organized a good old-fashioned taco crawl. So, one mild Thursday evening in June, I joined Ed and three other local foodies (Micaela, her husband Brian, and Tina) for a ramble down Calle Ocho, hitting two places that I hadn’t yet experienced: Asadero Los Compadres. 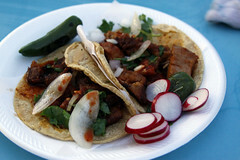 Located in a parking lot at 8th and 20th, Los Compadres is your basic “taco truck” supplemented with an outdoor grill and a good selection of tables. All of us were really looking to sample, so we all ordered the same thing: three tacos, one each cabeza, asada, and pastor. All of these were of good quality. I really enjoyed the nicely stewed flavor of this cabeza, with nice soft texture, deep flavor, and no stringiness. The pastor was nicely spiced, had a good char, and wasn’t greasy. However, the asada was the star here, with excellent tenderness, light spicing that let the meat flavors shine, coupled with a some nice smokiness from the grill. Los Compadres really seems to know how to run an asadero. My jamaica was also good, nicely rounded in flavors without being too bitter or two sweet. Just the right balance of fruit and hibiscus notes made that a pleasant refreshment. Afterwards, we all had some leftover stomach space, so we continued down Calle Ocho until we got to the next taco joint that I hadn’t tried yet: Tacos Coronas. I’ve known about this place since 2007 (the large Corona sign is very visible), but I hadn’t yet stopped in. I’m glad I did, since I ended up with a nice collection of tacos here as well, including a pollo taco and another pastor. I’m glad we stopped here, since Tacos Corona really had their act dialed in that night. These were hands-down the best pollo tacos from this trip, with a nice sear (even a slight crunch), a good smoky flavor, nice spicing, and fully tender meat. That’s exactly what grilled chicken is supposed to be like. The pastor was almost as good, near-perfect in execution (only flaw was perhaps a bit too much fat). Again, the flavor spot-on, the spicing right, and the meat nicely seared. Rounded out with a large fresh lemonade, and it was quite the nice “second dinner”. And, for what it’s worth, you can read Ed’s description of the same taco crawl over at Mmm-yoso. I had a thoroughly pleasant time. And, as Micaela said, “it’s so nice to go out with people who don’t think that it’s weird to talk about food all night,” especially with people that aren’t requiring their food to come from buildings with actual walls.